"Can I book an Escape Room on Groupon?" "Do you have a groupon for Cracked it! Escape Games?" We do get asked from time to time if we participate in Groupon, Social Living, or other daily deal sites. While some Escape Room businesses feel that Groupon is valuable to their business, Groupon is not a part of our current marketing plan, and we don't anticipate it in the future. Our goal is to provide an extraordinary entertainment experience that is unsurpassed in the Jacksonville and Camp Lejeune community. Providing a top notch escape room experience is what drives our passion. We understand the appeal of discount programs like Groupon. Our goal is to provide a family entertainment attraction that exceeds all expectations and is the ultimate in value. Our staff is dedicated to you and ensuring that you have an incredible time in our escape games. On Monday or Thursday we have our #GIVEBACK initiative. 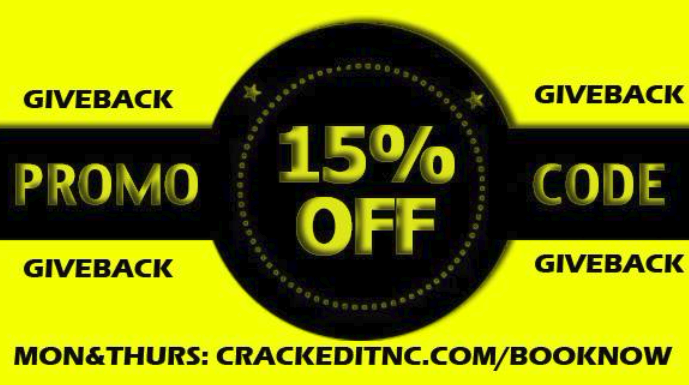 We give you a 15% discount and we donate 10% of our proceeds to local charities. Since we have opened we have donated over $5,000 to local charities in the Onslow County community. Use promotion code GIVEBACK when you book your experience. Give Back Discount on Monday or Thursday. Use Promo Code GIVEBACK when booking online. Do you have a military discount on Escape Room Experiences? Absolutely! We are a military family and honor our Military and First Responders every day. We offer a 10% discount on all Escape Games, every day. When you book simply check the number of Military members and present your ID on arrival. Do You Offer Any Other Promotions or Discounts? From time-to-time we do offer specials and discounts on our Escape the Room Games. We will promote those offers on all of our various social media channels. If you would like to receive direct notification when we are running these specials and discounts we do have an email list.